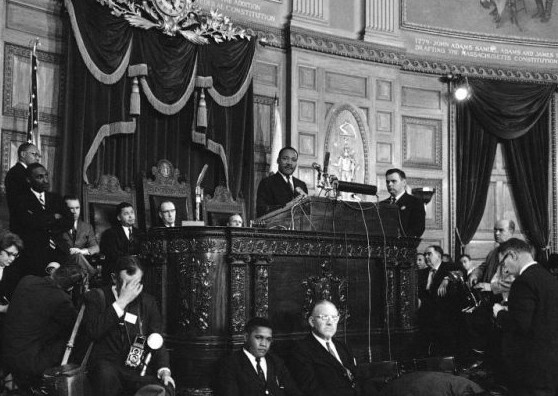 Yesterday (Monday), as we celebrated Martin Luther King Jr. Day, I thought back to the time when the civil rights leader took center stage in the Massachusetts State House and spoke to Beacon Hill lawmakers. I wished I could have been there, but it took place on April 22, 1965, a little over a month after the 1965 Bloody Sunday march from Selma to Montgomery. It was King's first ever speech before a legislative body and his words were certainly prescient. He warned us about what could happen when so many Americans are "constantly fighting a nagging sense of "nobodyness." Still, he concluded his speech saying he had faith in America and believed the nation would solve the problem of racial injustice. I share his optimism, but understand that there is still work to be done. I am happy to join you on the continuous path towards social justice. You can view the text of the speech, along with a prayer offered by Reverend Michael E. Haynes of Boston, and the address of the Honorable John F. X. Davoren of Milford, Speaker of the House of Representatives, by clicking here. Please accept my best wishes for a Happy New Year and for continued success. Copyright © 2018 State Rep Jeff Roy, All rights reserved. You are receiving this email because you either contacted our office or indicated you wanted to keep updated on the 10th Norfolk District and things going on at the State House.